Making money isn’t the point of Animal Crossing as a series. It’s more about taking it easy and making friends in the forest. 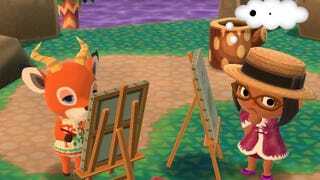 But if you are interested in making some quick cash in Animal Crossing: Pocket Camp, here’s what you should be doing. You might already know that villagers at your campgrounds can still give you quests. If you tap on your camp, and then tap on the heads of each villager there, you can see if they want any fruit, fish or bugs. You should also just make a point of talking to them, even if they don’t want anything. A lot of the time, your villagers will have a gift for you, be it crafting materials or bells. You’ll also increase your friendship with the villagers when you do this. Every three hours, your villagers will move around. At the same time, avatars from players will also populate your map, with one new player at each area. If you’re short on friends, here’s a chance to add four new friends every couple of hours. Most people will accept your requests, as there’s no real incentive not to. Alternatively you could post your friend code on social media, and Pocket Camp will even helpfully copy the code for you to post it somewhere. Having a healthy friends list can make things like the Marketbox or Shovelstrike Mountain way more helpful to you. It’s easy to forget about the Marketbox, but don’t. Sometimes it’s easier to just scroll down your friends list and get the one quest item this way rather than doing the fishing, fruit picking or bug catching yourself. Don’t forget to stock, and restock your own Marketbox items. Even if it’s just a couple extra fish, someone will probably buy it, and you can always use the bells. Actually going to Shovelstrike Mountain is kind of a bust in terms of rewards. You may get a rare crafting material and a handful of bells, but it’s usually not worth the effort of going there. At the end of the tutorial, the game will taunt you with the promise of rewards if you get five friends to lend you a hand—or pay 20 Leaf Tickets—to get there. What the tutorial doesn’t tell you is that you get a reward for lending a hand to players on your friends list. This can be a goldmine. You’ll either earn 100 or 10 bells for each friend you help. If you make sure to check which of your friends need help every time you log on, and just before you log off, you can make a tidy sum by the end of the day. When you complete quests for villagers, you’ll earn not only crafting materials and bells, but increase your friendship level with them. When you make it to a new friendship level, you’ll usually earn an extra reward of bells and crafting materials. Those first three levels go by very quickly, so it’s in your best interest to reap those rewards as soon as you can. Usually you’ll get 100 bells for completing a quest and then 200 bells for raising a level, so after three quests and three levels, you’ll earn a not unsubstantial 900 bells. After level three it’s just a bit harder to raise friendship levels, so it stops being worth it to attend to your new animal friend’s every need. Increasing your friendship level with villagers also helps you increase your overall level, and when that rolls over you’ll get another 1,000 bells. When you shake a tree, you’ll need to wait three hours for the fruit to regrow. Not so with fish or bugs, which re-populate every time you leave the area and come back. This is a good way to stock up on items you’ll probably need later. Even if you don’t need that Tiger Butterfly now, it doesn’t hurt to catch it, come back, and then see if there’s the bug you actually need. Over time, bugs and fish will populate in fewer numbers until all the villagers move around, but you’ll probably have an overflowing bounty by then.